Over the past few months a friend has helped me create a MoteinoMEGA variant with a trace antenna tuned for between 768Mhz to 1.16GHz. So this should be great for 868-915mhz. I’ve tested this variant myself (915mhz) and I was surprised how well it performs compared to a wire monopole (which will still be better given the type of antenna). I did not do extensive testing but I am pretty confident this turned out as a great antenna and I am offering the remainder of this batch for those eager to have one and perhaps do more testing on their own. Depending on the response I may or may not ever make more of these, we shall see. 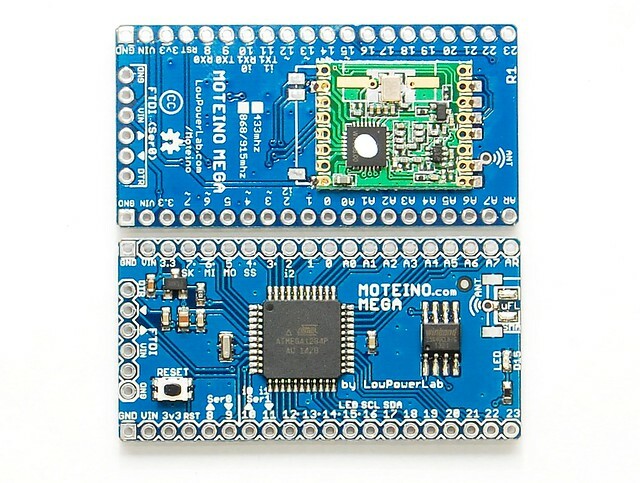 The same antenna could be used with any other Moteino but I want to see the response of the users before I invest too much capital in new batches of Moteinos. The ANT pad and u.FL footprint are still there if for some reason the user wants to cut off the trace antenna and use one of those instead with a monopole or different antenna. Otherwise everything else is the same, well, except the yellow soldermask which has a nice orange hue from my new PCB supplier. I will offer these with RFM69W/HW in 868/915mhz or without a transceiver, your choice. Enjoy. UPDATE: Library/Eagle files/MEGA Arduino Core/Example update notes are here. It’s alive and it’s BLUE! After long PCB manufacturing delays and a lot of headaches, the PCBs finally arrived, and I assembled the first batch of MoteinoMEGAs today and they are available in the shop. 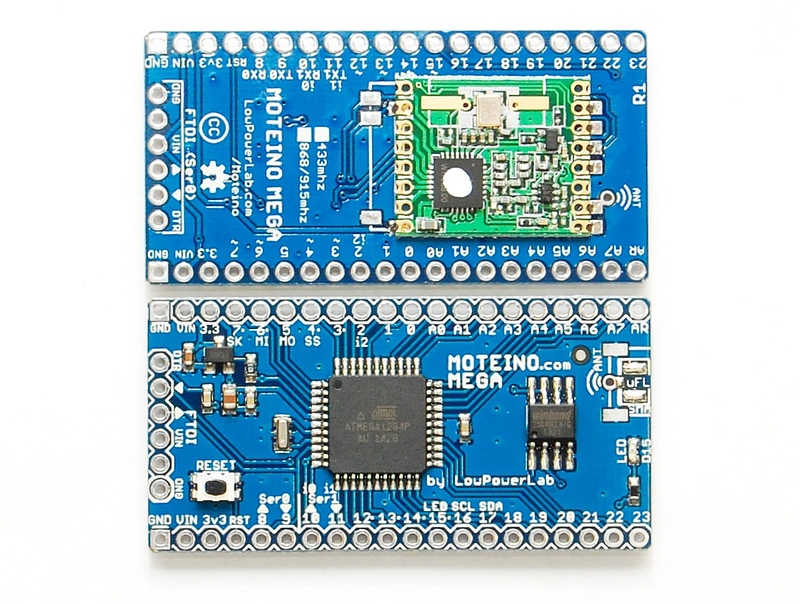 MoteinoUSB is also back in stock now. 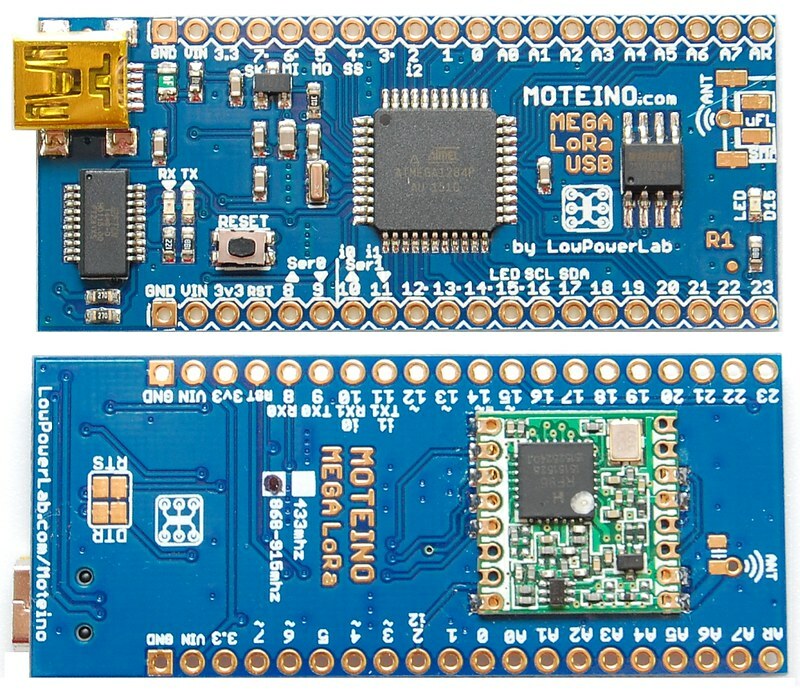 Worth noting that all Moteinos have started to ship with MCP1703 regulator which allows up to 16V input. MightyBoost is being worked on and should become available in a few days if all is well. There is a major release of patches coming to the RFM69 library, wireless programming library, SPIFlash library, along with the new MoteinoMEGA arduino core that will be released soon. DualOptiboot is will also be upgraded to V5 and is compatible with Moteino, MoteinoUSB and MoteinoMEGA. All these boards are wirelessly programmable via DualOptiboot and the FLASH chip. The MEGA board will have a limit of 64kb wireless image upload even though the total flash available is 127/128KB (DualOptiboot takes 1K).